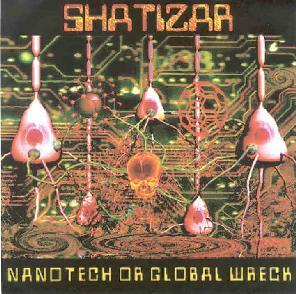 Shatizar - "Nanotech or Global Wreck"
Looking like refugees from the set of The Road Warrior, the members of Shatizar claim they were astronauts sent by the government on a secret mission to space, where they encountered the Korelyans, and have now returned to Earth to bring the Korelyan message of peace and preservation of our world. Shatizar is a trio of musicians originally from New York, who now base themselves out of Puerto Rico, and includes Sasha Harsh on bass and lead vocals, Illyich on guitar and backing vocals, and Zar on drums and backing vocals. Drawing on influences from early 80’s post punk, like The Slits and other proto grrrl power bands, and the pre-industrial, doomy sci-fi rock of Chrome, Shatizar amps up the energy, and belts out their songs with in-your-face attitude to spare. What sets them apart from their post-punk forebears, though, is the complexity of their arrangements. Zar especially sets the tone, pounding out complicated, ever changing rhythms on the skins, from the syncopated beats that characterized the reggae roots of post punk, to driving machine-like rhythms, to wild tribal freakouts. Sasha Harsh is up to the challenge on bass, and her punk-style vocals, while rarely understandable, still add to the frenzied energy of the songs. Meanwhile, Illyich’s guitar cuts through it all like a buzz saw. Is it the sound of the future, or a blast from the past? You be the judge. You can visit Shatizar at their web site: http://www.shatizar.com, and hear some sound clips from their full-length album, Global Warming.